Enjoy an oil diffuser that comes with real bamboo finish while maintaining a compact and portable design. No matter where you plan to use your diffuser, its natural design will make it the perfect addition to any kind of décor, whether it is at work or in the coziness of your home. The LED light provides a softer and suffused illumination that'll help you relax and won't keep you awake instead. By the spread of essential oil microparticles into the air, it will add oxygen molecule to the air and essential oils help effectively eliminate the odor, which can create an comfortable environment for living. This aroma diffuser comes with a built-in safeguard that'll automatically turn it off when the water level is low. That means you'll be able to turn it on at bed time and enjoy purified air during your sleep without any concern whatsoever. 1. Do not exceed MAX line when refilling water, otherwise mist may be low. 2. Please clean your diffuser regular after 3 times of use. 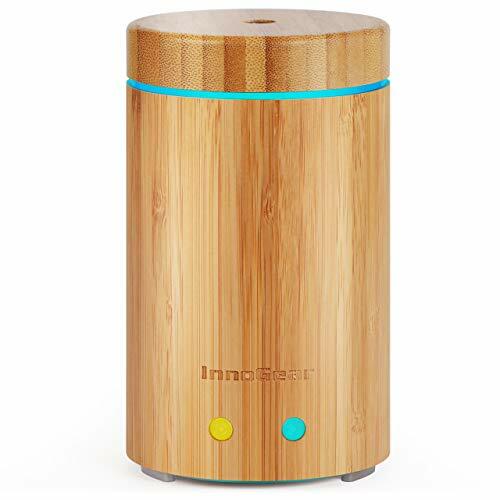 Real Bamboo Finish and Sleek Design: With attractive and natural looking, this diffuser is made of the high quality bamboo wood and covered with a thin protective coat of lacquer. Upgraded Air Outlet: Specially designed air outlet to keep mist coming out more smoothly and ensures a longer working life of diffuser. 2 Misting Modes with Timer Setting: Continuous mist/ intermittent mist (mist and pause every 10 seconds)/ 2Hrs timer / 1Hr timer. Safe Waterless Auto Off: It will automatically power off when it is detected there is little water. No worry about causing any harm to you or the machine itself. 7 Color Quiet Nightlight: This ultrasonic diffuser creates a relaxing & romantic ambience for you. Put it in your or your child's room & use it as a night light for a restful sleep.